In March 2012 I started to make a Tova, I didn’t get very far, I was put off sewing the inset into the front and gave up, afterall I was only using fabric from a nightdress I found at the car boot for my trial run. 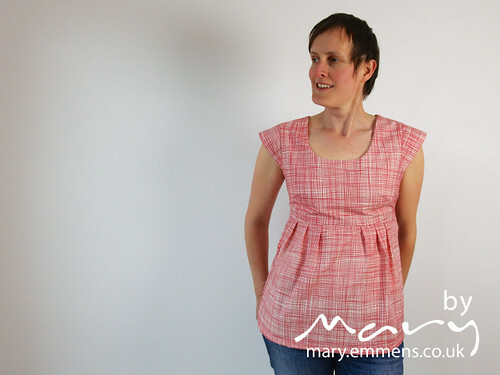 But Kerry did a Tova Sew-a-long with lots of hints and tips on adjusting the pattern, so I decided that now was the time to give it a go. I carefully read all of Kerry’s posts and made notes as I went along. So I lengthened the sleeves from 3/4 to full and took on all the hints and tips available. I made it dress length rather than top/tunic and I think I’ll be wearing it with leggings. While the extension to our house is not finished we do now have a large white wall which is great for photographing against. 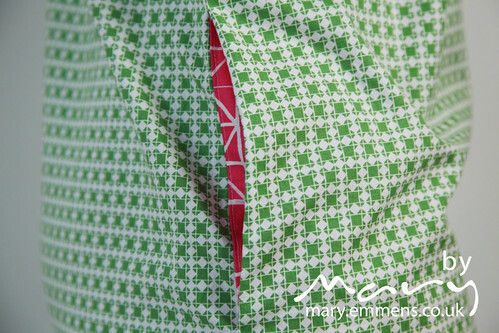 The main fabric I used is Marine Green Tic Tac Check from the Quilt Blocks line by Ellen Luckett Baker and the pocket is Pink Stars from the same line. 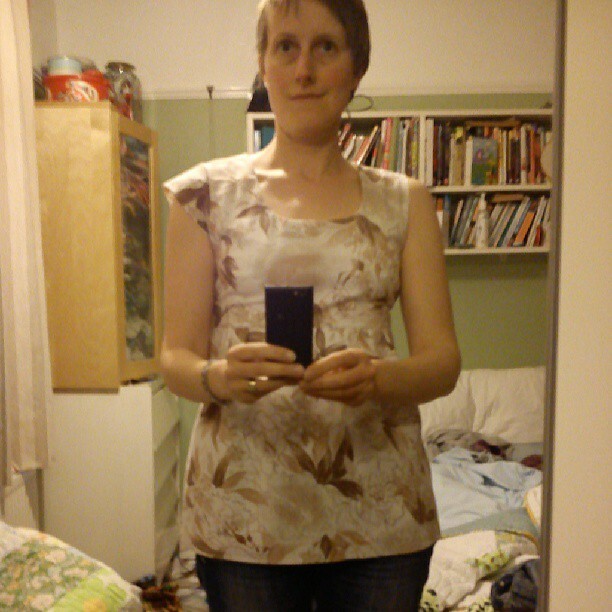 I’m pretty pleased with how this turned out, but more delighted that I got over my fear of the pattern and sewed it! So while the Tova was finished (ok it was hanging up waiting to be hemmed) I debated what was to be next! Yep, you read that right. There has been all this talk about and sewing of the Washi dress since last summer when Rae put the pattern up for sale but was it for me? I’m not one for spending money on a pattern and then not using it (yes I’ve been mentally beating myself round the head for the last year for not using the Tova pattern), so after doing some reading and seeking opinions I bought it. Whilst taking notes from Kerry I decided I needed to get hold of some Swedish Tracing paper for my continued venture into dressmaking, so upon finding the only known stockist in the UK out of stock I did a bit of searching and found some on ebay. How surprising to find that it was being sold in the UK by someone in my city, with my brain switched right on I worked out that it was being sold by a lovely lady I know who happens to live 5 minutes walk from me! The next evening she kindly hand delivered 5 metres of the stuff to my door. So now that I have my own stash I’ll tell you that you can buy some from her yourself here. And please note that it’s not 29″ wide like the paper sold elsewhere but 59″ (150cm) wide! The Washi pattern duly traced, I used the tracing paper to make a muslin of the bodice to get the fit right, to say I felt like I didn’t know what I was doing is an understatement but after trying a large and then basting it smaller into a medium I opted for that and made no other adjustments. 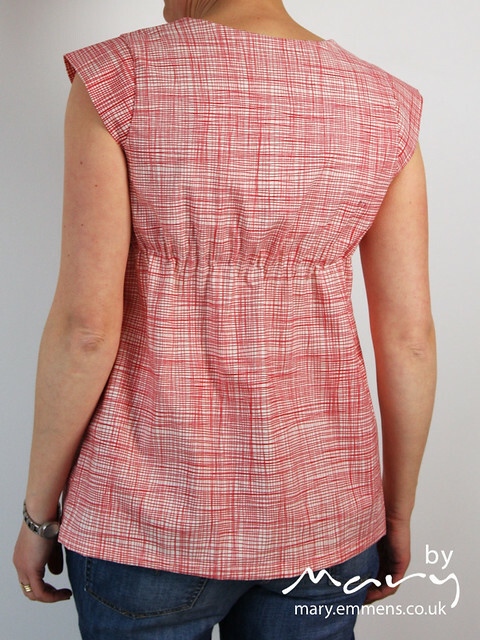 Word has it that one sleeved tops aren’t all the rage! Fabric: Crosshatch London Bus Red from Summersville by Lucie Summers, actually bought with the intention of dressmaking so big tick for me on that one. 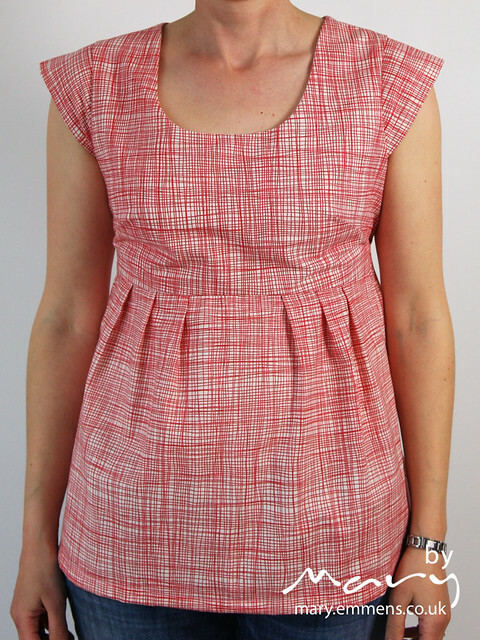 You’ve reminded me; I’ve had the Tova top pattern for ages and not used it. 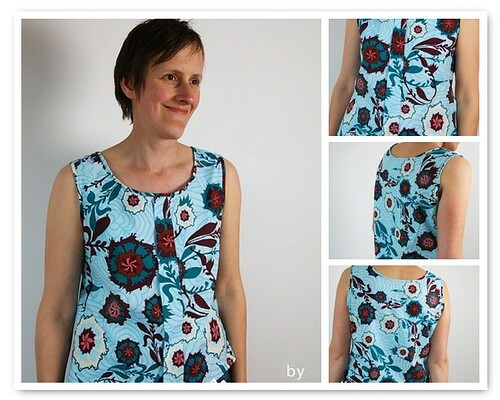 You’ve done a great job making yours; It looks fabulous as does the Washi top!!! Love that red fabric. Great results all round Mary! What a turn up for the Swedish paper! They are fantastic Mary! 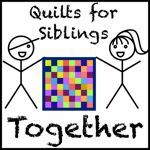 I really love that quilt blocks fabric and it looks perfect in the tova!! A great success!! Well done you. The washi is my favourite though they are all great. Looking forward to seeing you model them at the retreat. brilliant makes. you need to add them to the me me me bee. Thanks for the heads up re Swedish tracing paper. I read on a sewing blog about using frost fleece from the garden centre (around 80p a metre) – my MIL has tried it and it works great. Wow! Well done! I still have to blog about my dress I made a few weeks ago…(I need a photographer!). Te Sorbetto top is on my list, it looks beautiful on you! I have a 241 tote bag with that same fabric, it’s nice to see different projects with the same fabric. I really like the Washi pattern, I must try that one too. Oh they both look stunning! Fabulous fabric choices on both counts! Beautiful! Brilliant!! I am so jealous of your skillz! Wow Mary! They are lovely, so inspiring! Mary, I think you did a wonderful job! It makes me want to go out and make something for myself! You look great!! I love all of these! I am trying to sew more for myself these days too, and finding it quite rewarding.